Make space for new beginnings, and dive more deeply into your mantra practice by exploring the stories and practices of the delightfully compassionate and obstacle-removing Lord Ganesh. Learn the meaning and power behind Ganesh, the Lord of Compassion and Remover of Obstacles. Through story telling, mantra, movement, chanting, meditation and sacred art, we will explore powerful means of releasing obstacles to inner happiness and freedom. Give yourself the time and space to nurture your peace of mind and creativity in connection with others. This half day retreat is designed to clear your mind and heart and make room for greater inner peace and happiness. Please come to this inspiring, fun, and nourishing workshop! Beginner friendly (no previous experience needed with yoga, meditation or art). Pre-registration is required to reserve your space. Please e-mail Anita at anitastoll@gmail.com with questions or register through PayPal. Lakshmi, the goddess of abundance and good fortune, is the embodiment of grace, contentment, generosity, and beauty. Give yourself the time and space to nurture your peace of mind and creativity in connection with others. This half day retreat is designed to fill your cup with contentment and the remembrance of your inner beauty. We’ll spend the morning deepening our experience of the divine feminine through story telling, mantra, meditation, hatha yoga, sacred art and group discussion. 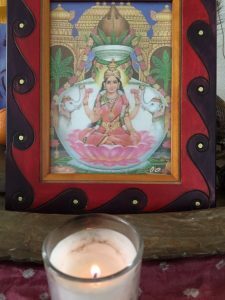 Participants will leave with a simple drawing of Lakshmi that can be the start of (or an addition to) a meditation altar. If you long to create a deeper connection to true beauty, inner abundance, and your spiritual heart center, please come to this inspiring, fun, and nourishing workshop! Absolutely beginner friendly (no previous experience needed with yoga, meditation or art). When: Sunday, October 21, 9:30 a.m. – 12:30 p.m. Call for dates, 8:30 a.m. - 6:30 p.m. Cost includes vegetarian lunch. Proceeds benefit SGRY and Austin Big Heart Yoga. All levels of experience are welcome. This meditation practice intensive is offered in coordination with our larger Shambhava Yoga community based out of Colorado. Intensives are an opportunity for participants to engage in very deep practice for one full day. Local participants will work together with Swamis and Acharyas (experienced senior teachers of the Shambhava tradition) via video broadcast throughout the day. The structure includes meditation instruction, meditation practice, and opportunities to ask questions in large and small group settings. Silence is often observed during breaks. Each Intensive includes about 8 hours of practice. Seated meditation is sometimes alternated with walking meditation, discussion, hatha yoga, and kirtan (chanting of sanskrit mantras), providing variety throughout the day.